After University, I spent some time travelling around South America. I spent most of the time in Argentina, a country which absolutely capitvated me, and it was the place that I first really enjoyed caramel, or dulce de leche as it is there. 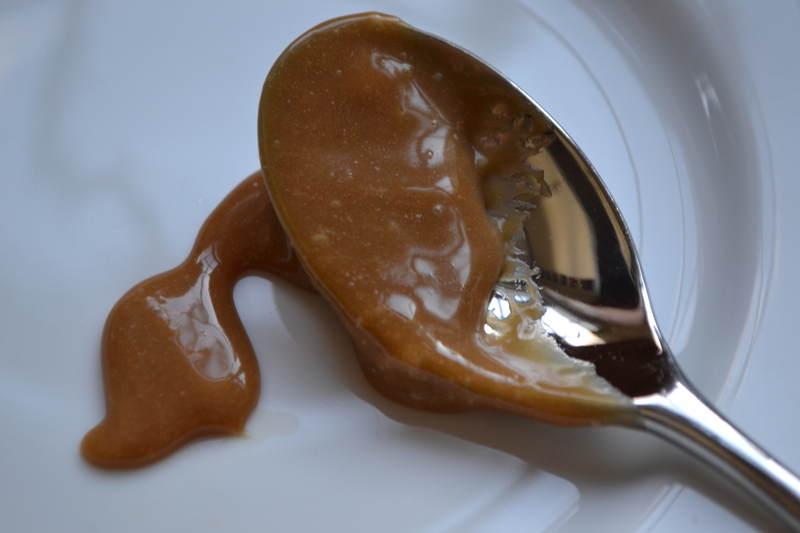 Dulce de leche is used extensively in Argentina. In our youth hostels, we were served hot black coffee and bread every morning, with a large jar of the stuff plonked on the table for us to spoon from and spread. The ice cream in Argentina is legendary, and I don’t mind admitting it is so good I was on about two ice creams a day whilst I was over there. Dulce de leche and dulce de leche granizado were my favourite flavours – the former being a uniform dark caramel colour with it mixed into the ice cream, and the latter being dulce de leche ice cream, with more of the stuff swirled through. In a word: amazing! Another use I loved was in alfajores – unsurprisingly, the artisan ones were always the best. The best ones I had were from Bariloche. You can get hold of it more readily now, and I have in fact asked for a jar from friends when they’ve been to Argentina, but some of it isn’t the best quality, so I had a go at making some myself, although I had to go for a salted version given my love of salted caramel. It makes a lovely gift decanted into a small Kilner jar. It is amazing spread on pretty much anything, but I think it’s particularly good drizzled onto ice cream. Or spooned out of the jar. Place all the ingredients together into a non-stick pan. Over a moderate heat whisk until the butter has melted and the sugar has dissolved. This should take around 15 minutes. Allow to cool and store in a glass jar in the fridge for up to 3 months. I’m definitely going to try this. Last time I tried to make salted caramel I ended up with a saucepan that needed soaking for ages and a rock hard concoction! Haven’t been tempted since although I love the stuff, but this sauce looks nicely simple even for me. Thank you so much Andrea. Do let me know how you get on if you make it! This is definitely on my list of things to make Charlotte. So delicious. I am quite tempted to try salted and non salted versions.. I have been thinking of making this for gifts this year and this recipe seems the easiest I have read so far. Just need to know where you got your dark brown Demerara or would the regular type work do you think? I had the best dessert this week, a salted caramel panna cotta. It was amazing! Thanks Laura – sorry it was dark brown muscovado – my fault for writing this up on the plane! Hope you like the sauce. Salted caramel panna cotta sounds insanely good! Keep in the fridge for up to THREE MONTHS? three months? Who is going to manage to hold out for that long? On serious note it look a great use of half tins of condensed milk, which I frequently have from no churn ice cream.